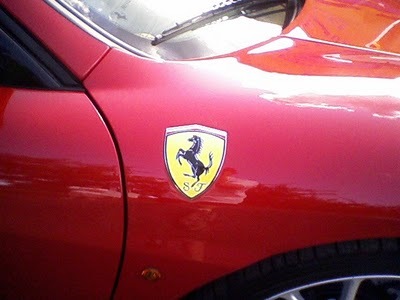 Would you rather be a clunker...or a Ferrari! The name alone inspires images of sleek design, unparalleled quality and peak performance! Even for me, a non car buff, the sight of a Ferrari gives me a sense of excitement. Here’s an important point to keep in mind as you read this post: Ferraris are Ferraris mostly because of what’s on the inside. Thinking back a couple of years, I remember a day when I drove my Subaru Forester to a trailhead near my home to go for a nice afternoon trail run. This particular trailhead is at one end of a very large parking lot which also happens to be close to an upscale resort. When I arrived, there were two large trucks offloading their special cargo -- priceless vintage automobiles that were arriving for the start of the Northwest Passage Vintage Rally. 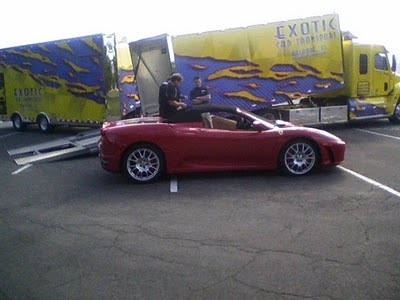 The two pictures in this post are of a Ferrari that was offloaded just as I arrived. According to my automobile consultant (my son), this is a Ferrari 360 Spyder. I marveled at the sleek, exquisite beauty of this car as well as all of the others I saw. It was obvious to me that the owners put a lot of loving care into their cars! Good example for all of us to follow, whether we happen to be proud owners of a Bently or a Bug. What if our car care system were like our healthcare system...? Car insurance would cover a blown engine or transmission, but not oil changes or tune-ups. A lot of people wouldn't bother with tune-ups. Mechanics (also known as Mechanical Doers or MDs) wouldn't know -- or care -- how to do tune-ups anyway. MDs may be able to slow down your clunkiness process, but not always. Sometimes they speed it up. MDs would only work with cars at the most superficial of levels, and would treat car problems by removing parts and by pouring lots and lots of DRUGS (Dangerous, Rust-producing Useless Gunky Substances) into them. Most people would buy cheap "junk fuel" that contained caustic ingredients that would significantly decrease their car's performance and would slice years off the life of the car. Even though people knew the fuel was bad, they'd buy it anyway. All the time. Our government would heavily subsidize junk fuel and DRUGS, and we would be indoctrinated during every television commercial break on how wonderful our cars will be if we always use junk fuel and DRUGS. Lots. Every day. The result is obvious: We would have a national fleet of clunkers. Ferraris would be rare indeed. Bring out your inner Ferrari! Share your thoughts! Please leave a comment in the box below. "Turn your health inside out!" Copyright 2011-2015, Dr. Mark William Cochran All rights reserved.